Your favourite childhood horror film about dead pets has come back to life! Following the success of the It remake, Stephen King properties, much like Disney’s classic animated films, are getting the remake treatment – unlike Disney’s classic animated films, there’s been plenty of terrible or at least underwhelming original films from the past, some of which are memorable only in a bad way (eg Tim Curry as the original It clown). But at least even terrible films like those are being remembered (for their terribleness). 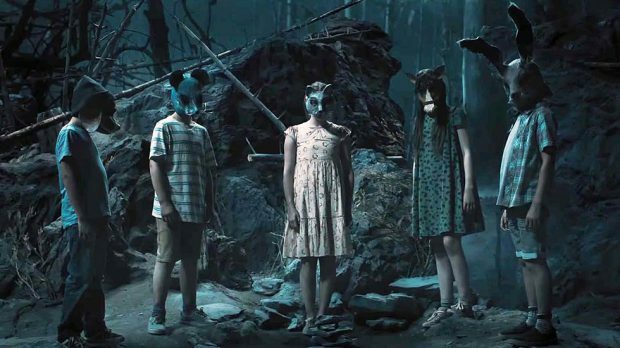 For 2019’s Pet Sematary, there are not many scares (or goofiness) to make it memorable. The blandness here, unfortunately lets down the film, rather than elevates the bits and pieces of horror greatness that are trying to arise. Like most Stephen King tales, Pet Sematary takes place in a fairly isolated foresty little town far away from big city stress, where doctor Louis (Jason Clarke) and his wife Rachel (Amy Seimetz) have just moved in to. Their daughter Ellie (Jeté Laurence) takes a shine to their next-door neighbour Jud (John Lithgow), but unfortunately, it’s not long before her beloved pet cat is found killed by the nearby highway trucks, and Jud is the one to break the news to Louis. They agree to bury the cat in the nearby pet cemetery and tell Ellie that he simply ran away. But Jud suggests they traverse high up in the spooky neighbouring forest area to the “burial ground”, which Louis agrees to without question, just ’cause. The next day he is surprised to find the cat has returned from the grave, but is evidently angrier and more hostile, leading to suspicions over Jud and this freaky burial area that can bring back the dead, but with a lot less life to them. It’s this simple concept that King crafted back in 1983 that makes this horror story so enticing. The moral ramifications of bringing loved ones back, but with a villainous side, is explored, discussed, and acted out, showing this compromise between grief and relief. Pet Sematary works like a spooky horror ride, with its gothic scenery of the cemetery/burial ground, the build-up of tension, and the loud noise jump-scares – the horror element here is at least startling enough to make you throw your food and drinks up in the air in fright, though isn’t going to have much of a horrific lasting effect to keep you up at night. It’s unfortunate that such great actors have been recruited here for such bland characters that have no identifiable traits other than to push ahead the story. Even constant flashbacks to Rachel’s childhood trauma has less to do with the story and the reanimation theme and more to do with throwing out some more jump-scares – once you’ve seen one, you’ve seen the next 12. For all the bone-chilling darkness this lightweight horror film lacks, it does save that for the very end with a particularly haunting ending that’s certainly not all sunshine and flowers. It may put a grin on your face once the film cuts to black, but everything before it is just too standard for a horror and far too vacuous for a drama.